Anna Morrison wanted nothing to do with entrepreneurship. That was her parents’ area of expertise. 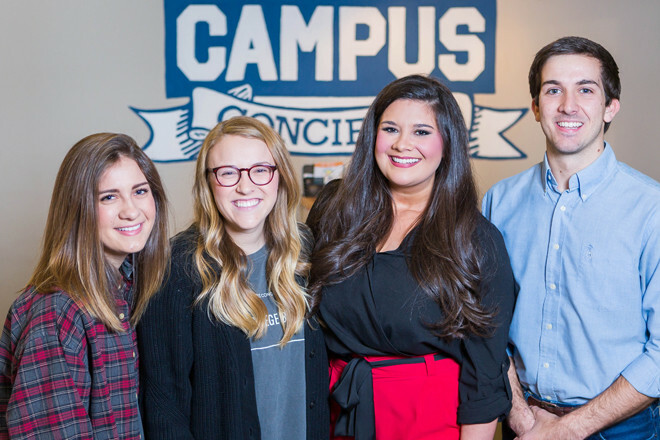 In 2012, Morrison’s parents came up with the idea of an all-encompassing tutoring and support program called Campus Concierge for college students at the University of Arkansas at Fayetteville. They handed the reins to their daughter, who had graduated from the UA with a degree in marketing management and economics. Morrison, Campus Concierge’s 27-year-old CEO, immediately saw the need to scale back the organization’s scope to focus on academic tutoring. Campus Concierge started with 10 tutors and 50 clients in 2012; it now has more than 120 tutors and 3,500 students and plans to expand to other universities in the state. Campus Concierge’s tutors are required to have a 3.5 grade-point average and have taken the class they are tutoring within the previous two semesters. Campus Concierge also holds individual and group tutoring sessions and workshops on resume writing and time management and devises personalized study plans for its clients. From 2014 to 2016, Morrison said, revenue has increased by 47 percent and income has increased by 150 percent annually. Morrison joked that she wasn’t a great test taker in school and her favorite subject was PE. She said Campus Concierge is designed to help students survive the shock of college studies, tests and independence. “A lot of students who come to college get really discouraged,” Morrison said. “This is where our mentoring came into play. We never want anybody to be determined by their GPA.